There is no better way to keep the entire family healthy and having fun than with a trampoline. When you are looking for a trampoline for your family, especially your children, you have to always consider safety first. For your little ones, you want a trampoline that has features that will not cause injury, as well as any other safety features in place. The AlleyOop DoubleBounce Trampoline by JumpSport is one of the safest trampolines on the market today. Created with family fun in mind, it was manufactured by a company with a CEO who was seeking a way to protect his children, while letting them have a good time. With this product, there are several safety systems in place to ensure that your children will not be harmed or injured, regardless if they are just jumping up and down or playing trampoline basketball. This trampoline has the most advanced safety system of any trampoline available on the market. It has airshock technology, as well as the patented triple fail safe enclosure. This guarantees that your small children will not fall off of the trampoline, even if they bounce over to the edge by mistake. A step above traditional trampolines, these features bring to the AlleyOop DoubleBounce a higher level of play performance and safety. As with many other trampolines from JumpSport, the AlleyOop DoubleBounce is made to reduce the number of injuries each year by misuse. It might surprise most people to know that many trampoline incidents take place on the mat, not by falling off of the trampoline. The DoubleBounce system (a double mat) is the reason why the number of mat injuries is significantly lower with this trampoline. The mat is made similar to a pillow, which makes jumping up and down less stressful on the body, making this suitable for adult jumpers. The design of the AlleyOop DoubleBounce is made with a shock absorption zone to let you and your family jump as high as everyone wants. AlleyOop DoubleBounce Trampoline reviewers all love that the mat can be rotated, giving the product longevity. The frame pad is thick and constructed with the quality material you would find in a gym mat. Moreover, there is an adjustable bounce performance that you can regulate as your children get older. The heavy-duty frame is constructed with pre-galvanized steel for sturdiness. Purchasers of this backyard trampoline can’t brag enough about the enclosure, which guarantees that children will not fall off. To protect your trampoline during the different seasons, especially the summer, this trampoline has a UV shield. In addition, there are above-average strength loop straps and steel v-rings that connect the springs. 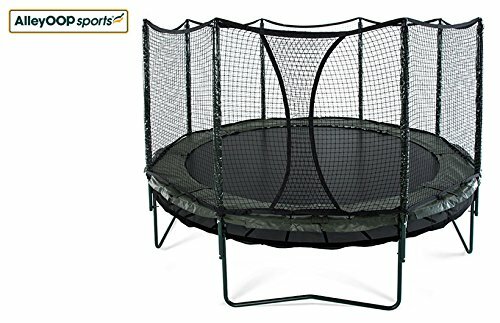 This is very different from the standard trampolines that have visible holes attaching the mat to the frame. The AlleyOop DoubleBounce Trampoline is really easy to use. Anyone and everyone can have a good time on this trampoline. Owners state that there young children not only have fun jumping up and down on the trampoline, but their teenagers and young adult children have fun as well. One owner stated that on any summer day, she has seven or eight young adults enjoying themselves at one time. The ease of use for the AlleyOop DoubleBounce is due to having extra-stretch high performance springs that gives you a great bounce with a low impact. There are a number of benefits for owning a trampoline. For example, if your children are involved with skateboarding, skiing, or cheerleading, they can practice jumps on the trampoline safely. With a single person, the weight limit is around 250 lbs. A combination weight limit for this trampoline is 800 lbs. Most owners stated that you definitely need help assembling this trampoline. Moreover, owners say that while it takes some time to get the AlleyOop DoubleBounce Trampoline together, it is worth it. The reason why it takes so much time is because of all the safety features. Every purchaser that wrote a review for the AlleyOop DoubleBounce says that this is an investment. One of the biggest differences you will notice is in the price. It is expensive, and definitely costs more than the average trampoline. Yet, owners say that they do not regret spending so much money on this trampoline, especially for all of the safety features it possesses. There is a reason why this trampoline is considered one of the best trampolines and created by one of the top trampoline manufacturers. In addition to the double mat, the safety net is the one feature that sold all of the buyers into purchasing this product. Although, a few users said that the net can be difficult for children to get in and out of at times. Furthermore, since the trampoline sits high off the ground, it is recommended that you purchase the three step ladder to use with the AlleyOop DoubleBounce Trampoline. This trampoline uses the best design and materials to give its customers the highest quality trampoline on the market. All of what this product offers is what makes it well worth the high price tag. If you have children, especially toddlers and young children, then it is safe to say that you want a trampoline that will keep them safe. There is no better trampoline than one with an enclosure. The AlleyOop DoubleBounce goes a step further by not only offering an enclosure, but also a double mat that will let them bounce as hard or soft as they choose without injury. It seems that the makers of this trampoline have thought of everything. That just leaves the choice of purchasing it up to you.